The Report of the Intergovernmental Panel on Climate Change released in September 2013 continues the pattern of previous ones raising alarm about a warming earth due to anthropogenic greenhouse gases. This paper identifies six problems with this conclusion – the mismatch of the model predictions with the temperature observations, the assumption of positive feedback, possible solar effects, the use of a global temperature, chaos in climate, and the rejection of any skepticism. THIS IS AN ASTROPHYSICIST’S VIEW OF CURRENT CLIMATOLOGY. I WELCOME CRITICAL COMMENTS. Many climatologists have been telling us that the environment of the earth is in serious danger of overheating caused by the human generation of greenhouse gases since the Industrial Revolution. Carbon dioxide (CO2) is mainly to blame, but methane (CH4), nitrous oxide (N2O) and certain chlorofluorocarbons also contribute. “As expected, the main message is still the same: the evidence is very clear that the world is warming, and that human activities are the main cause. Natural changes and fluctuations do occur but they are relatively small.” – John Shepard in the United Kingdom, 2013 Sep 27 for the Royal Society. “We can no longer ignore the facts: Global warming is unequivocal, it is caused by us and its consequences will be profound. But that doesn’t mean we can’t solve it.” -Andrew Weaver in Canada, 2013 Sep 28 in the Globe and Mail. “We know without a doubt that gases we are adding to the air have caused a planetary energy imbalance and global warming, already 0.8 degrees Celsius since pre-industrial times. This warming is driving an increase in extreme weather from heat waves to droughts and wild fires and stronger storms . . .” – James Hansen in United States, 2013 Dec 6 CNN broadcast. Are these views valid? In the past eminent scientists have been wrong. Lord Kelvin, unaware of nuclear fusion, concluded that the sun’s gravitational energy could keep it shining at its present brightness for only 107 years. Sir Arthur Eddington correctly suggested a nuclear source for the sun, but rejected Subrahmanyan Chandrasekhar’s theory of degenerate matter to explain white dwarfs. In 1983 Chandrasekhar received the Nobel Prize in Physics for his insight. My own expertise is in physics and astrophysics with experience in radiative transfer, not climatology, but looking at the discipline from outside I see some serious problems. I presume most climate scientists are aware of these inconsistencies, but they remain in the Reports of the Intergovernmental Panel on Climate Change (IPCC), including the 5th one released on 2013 Sep 27. Politicians and government officials guiding public policy consult these reports and treat them as reliable. A necessary test of any theory or model is how well it predicts new experiments or observations not used in its development. It is not sufficient just to represent the data used to produce the theory or model, particularly in the case of climate models where many physical processes too complicated to code explicitly are represented by adjustable parameters. As John von Neumann once stated “With four parameters I can fit an elephant, and with five I can make him wiggle his trunk.” Four parameters will not produce all the details of an elephant, but the principle is clear. The models must have independent checks. Fig. 1. Global Average Temperature Anomaly (°C) upper, and CO2 concentration (ppm) lower graphs from http://www.climate.gov/maps-data by the U.S. National Oceanic and Atmospheric Administration. The extension of the CO2 data to earlier years is from the ice core data of the Antarctic Law Dome ftp://ftp.ncdc.noaa.gov/pub/data/paleo/icecore/antarctica/law/law_co2.txt. The upper plot in Fig. 1 shows how global temperatures have varied since 1880 with a decrease to 1910, a rise until 1945, a plateau to 1977, a rise of about 0.6 ºC until 1998 and then essentially constant for the next 16 years. Meanwhile, the concentration of CO2 in our atmosphere has steadily increased. Fig. 2 from the 5th Report of the Intergovernmental Panel on Climate Change (2013) shows that the observed temperatures follow the lower envelope of the predictions of the climate models. Fig. 2. 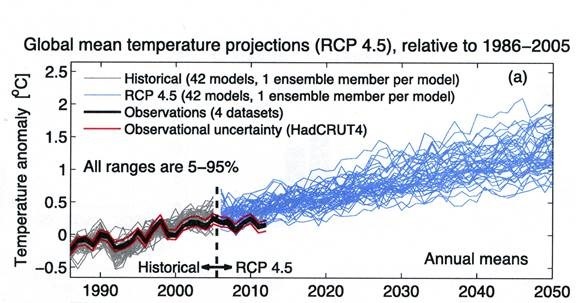 Model Predictions and Temperature Observations from IPCC Report 2013. RCP 4.5 (Representative Concentration Pathway 4.5) labels a set of models for a modest rise in anthropogenic greenhouse gases corresponding to an increase of 4.5 Wm–2 (1.3%) in total solar irradiance. 4) a deep ocean reservoir for the missing heat. Extra warming due to the 1978 El Nino seems plausible, but there have been others that could have caused some of the earlier warming and there are also cooling La Nina events. All proposed causes of the plateau must have their effects on the warming also incorporated into the models to make predictions that then can be tested during the following decade or two of temperature evolution. There is no controversy about the basic physics that adding CO2 to our atmosphere absorbs solar energy resulting in a little extra warming on top of the dominant effect of water vapor. The CO2 spectral absorption is saturated so is proportional to the logarithm of the concentration. 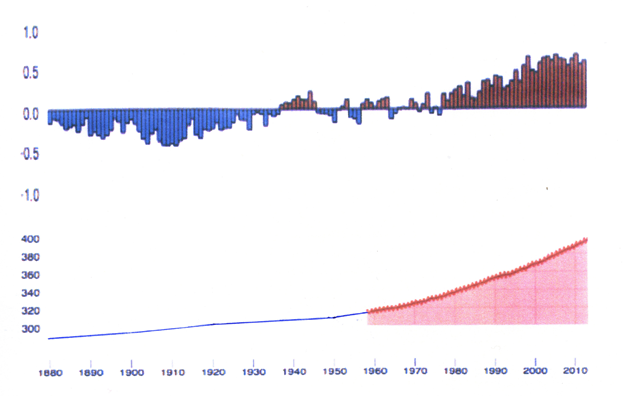 The estimated effect accounts for only about half the temperature rise of 0.8 ºC since the Industrial Revolution. Without justification the model makers ignored possible natural causes and assumed the rise was caused primarily by anthropogenic CO2 with reflections by clouds and other aerosols approximately cancelling absorption by the other gases noted above. Consequently they postulated a positive feedback due to hotter air holding more water vapor, which increased the absorption of radiation and the backwarming. The computer simulations represented this process and many other effects by adjustable parameters chosen to match the observations. As stated on p. 9-9 of IPCC2013, “The complexity of each process representation is constrained by observations, computational resources, and current knowledge.” Models that did not show a temperature rise would have been omitted from any ensemble so the observed rise effectively determined the feedback parameter. Now that the temperature has stopped increasing we see that this parameter is not valid. It even could be negative. CO2 absorption without the presumed feedback will still happen but its effect will not be alarming. The modest warming possibly could be a net benefit with increased crop production and fewer deaths due to cold weather. The total solar irradiance, the flux integrated over all wavelengths, is a basic input to all climate models. Fortunately our sun is a stable star with minimal change in this output. Since the beginning of satellite measures of the whole spectrum in 1978 the variation has been about 0.1% over the 11-year activity cycle with occasional excursions up to 0.3%. The associated change in tropospheric temperature is about 0.1 ºC. Larger variations could explain historical warm and cold intervals such as the Medieval Warm Period (approx. 950 – 1250) and the Little Ice Age (approx. 1430 – 1850) but remain as speculations. The sun is a ball of gas in hydrostatic equilibrium. Any reduction in the nuclear energy source initially would be compensated by a gravitational contraction on a time scale of a few minutes. Complicating this basic picture are the variable magnetic field and the mass motions that generate it. Li et al. (2003) included these effects in a simple model and found luminosity variations of 0.1%, consistent with the measurements. However, the sun can influence the earth in many other ways that the IPCC Report does not consider, in part because the mechanisms are not well understood. The ultraviolet irradiance changes much more with solar activity, ~ 10% at 200 nm in the band that forms ozone in the stratosphere and between 5% and 2% in the ozone absorption bands between 240 and 320 nm according to DeLand & Cebula (2012). Their graphs also show that these fluxes during the most recent solar minimum were lower than the previous two reducing the formation of ozone in the stratosphere and its absorption of the near UV spectrum. How this absorption can couple into the lower atmosphere is under current investigation, e. g. Haigh et al. (2010). Fig. 3 – Monthly averages of the 10.7 cm solar radio flux measured by the National Research Council of Canada and adjusted to the mean earth-sun distance. A solar flux unit = 104 Jansky = 10-22 Wm-2 Hz-1. The maximum just past is unusually weak and the preceding minimum exceptionally broad. Graph courtesy of Dr. Ken Tapping of NRC. Decreasing solar activity also lowers the strength of the heliosphere magnetic shield permitting more galactic cosmic rays to reach the earth. Experiments by Kirkby et al. (2011) and Svensmark et al. (2013) have shown that these cosmic rays can seed the formation of clouds, which then reflect more sunlight and reduce the temperature, though the magnitude of the effect remains uncertain. Morton (2014) has described how the abundances cosmogenic isotopes 10Be and 14C in ice cores and tree rings indicate past solar activity and its anticorrelation with temperature. Fig. 4. 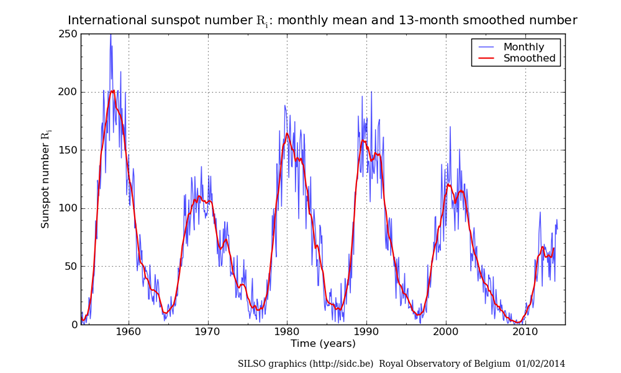 Monthly sunspot numbers for the past 60 years by the Royal Observatory of Belgium at http://sidc.oma.be/sunspot-index-graphics/sidc_graphics.php. 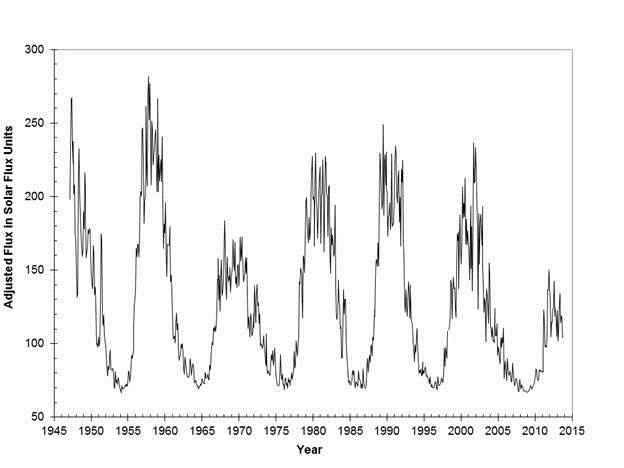 over six solar cycles even when there are no sunspots. The last minimum was unusually broad and the present maximum exceptionally weak. The sun has entered a phase of low activity. Fig. 5 shows that previous times of very low activity were the Dalton Minimum from about 1800 to 1820 and the Maunder Minimum from about 1645 to 1715 when very few spots were seen. Since these minima occurred during the Little Ice Age when glaciers were advancing in both Northern and Southern Hemispheres, it is possible that we are entering another cooling period. Without a physical understanding of the cause of such cool periods, we cannot be more specific. Temperatures as cold as the Little Ice Age may not happen, but there must be some cooling to compensate the heating that is present from the increasing CO2 absorption. Regrettably the IPCC reports scarcely mention these solar effects and the uncertainties they add to any prediction. Long-term temperature measurements at a given location provide an obvious test of climate change. Such data exist for many places for more than a hundred years and for a few places for much longer. With these data climatologists calculate the temperature anomaly – the deviation from a many-year average such as 1961 to 1990, each day of the year at the times a measurement is recorded. Then they average over days, nights, seasons, continents and oceans to obtain the mean global temperature anomaly for each month or year as in Fig. 1. Unfortunately many parts of the world are poorly sampled and the oceans, which cover 71% of the earth’s surface, even less so. Thus many measurements must be extrapolated to include larger areas with different climates. Corrections are needed when a site’s measurements are interrupted or terminated or a new station is established as well as for urban heat if the meteorological station is in a city and altitude if the station is significantly higher than sea level. Fig. 5. This plot from the U. S. National Oceanic and Atmospheric Agency shows sunspot numbers since their first observation with telescopes in 1610. Systematic counting began soon after the discovery of the 11-year cycle in 1843. Later searching of old records provided the earlier numbers. The IPCC Reports refer to four sources of data for the temperature anomaly from the Hadley Centre for Climate Prediction and Research and the European Centre for Medium-range Weather Forcasting in the United Kingdom and the Goddard Institute for Space Science and the National Oceanic and Atmospheric Administration in the United States. For a given month they can differ by several tenths of a degree, but all show the same long-term trends of Fig. 1, a rise from 1978 to 1998 and a plateau from 1998 to the present. These patterns continue to be a challenge for researchers to understand. Some climatologists like to put a straight line through all the data from 1978 to the present and conclude that the world is continuing to warm, just a little more slowly, but surely if these curves have any connection to reality, changes in slope mean something. Are they evidence of the chaotic nature of climate with abrupt shifts from one state to another? This questionable use of a global temperature along with the problems of modeling a chaotic system discussed below raise basic concerns about the validity of the test with observations in Section 2. Since climatologists and the IPCC insist on using this temperature number and the models in their predictions of global warming, it still is appropriate to hold them to comparisons with the observations they consider relevant. Essex and McKitrick (2007) have provided a helpful introduction to this problem. Thanks to the pioneering investigations into the equations for convection and the associated turbulence by meteorologist Edward Lorenz, scientists have come to realize that many dynamical systems are fundamentally chaotic. The situation often is described as the butterfly effect because a small change in initial conditions such as the flap of a butterfly wing can have large effects in later results. Convection and turbulence in the air are central phenomenon in determining weather and so must have their effect on climate too. The IPCC on p. 1-25 of the 2013 Report recognizes this with the statement “There are fundamental limits to just how precisely annual temperatures can be projected, because of the chaotic nature of the climate system.” but then makes predictions with confidence. Meteorologists modeling weather find that their predictions become unstable after a week or two, and they have the advantage of refining their models by comparing predictions with observations. Why do the climate models in the IPCC reports not show these instabilities? Have they been selectively tuned to avoid them or are the chaotic physical processes not properly included? Why should we think that long-term climate predictions are possible when they are not for weather? Frequently we hear that we must accept that the earth is warming at an alarming rate due to anthropogenic CO2 because 90+% climatologists believe it. However, science is not a consensus discipline. It depends on skeptics questioning every hypothesis, every theory and every model until all rational challenges are satisfied. Any endeavor that must prove itself by appealing to consensus or demeaning skeptics is not science. Why do some proponents of climate alarm dismiss critics by implying they are like Holocaust deniers? Presumably most climatologists disapprove of these unscientific tactics, but too few speak out against them. At least six serious problems confront the climate predictions presented in the last IPCC Report. The models do not predict the observed temperature plateau since 1998, the models adopted a feedback parameter based on the unjustified assumption that the warming prior to 1998 was primarily caused by anthopogenic CO2, the IPCC ignored possible affects of reduced solar activity during the past decade, the temperature anomaly has no physical significance, the models attempt to predict the future of a chaotic system, and there is an appeal to consensus to establish climate science. Temperatures could start to rise again as we continue to add CO2 to the atmosphere or they could fall as suggested by the present weak solar activity. Many climatologists are trying to address the issues described here to give us a better understanding of the physical processes involved and the reliability of the predictions. One outstanding issue is the location of all the anthropogenic CO2. According to Table 6.1 in the 2013 Report, half goes into the atmosphere and a quarter into the oceans with the remaining quarter assigned to some undefined sequestering as biomass on the land. Meanwhile what policies should a responsible citizen be advocating? We risk serious consequences from either a major change in climate or an economic recession from efforts to reduce the CO2 output. My personal view is to use this temperature plateau as a time to reassess all the relevant issues. Are there other environmental effects that are equally or more important than global warming? Are some policies like subsidizing biofuels counterproductive? Are large farms of windmills, solar cells or collecting mirrors effective investments when we are unable to store energy? How reliable is the claim that extreme weather events are more frequent because of the global warming? Is it time to admit that we do not understand climate well enough to know how to direct it?